One of the joys of having your own place is being able to make it yours and turn a house into a home. In the bathroom just changing the fittings can refresh the whole room. But DIY in the bathroom can seem intimidating and attaching fittings where you want them is either permanent or simply impossible (and a big no-no if you&apos;re renting). What if you could have the freedom to experiment with the layout of your bathroom, without the need for any drilling? Well you can! With Sugru, it&apos;s easy to attach fittings exactly where you want them — even if it&apos;s somewhere you wouldn&apos;t be able to drill, like your hand basin! Sugru is hand-mouldable and sticks to lots of different materials found in the bathroom, like ceramic tiles, glass and metals. And because Sugru is removable you can always take it off again in years to come, if you ever need to. It&apos;s super easy to do and will only take a few minutes to attach each fixing. 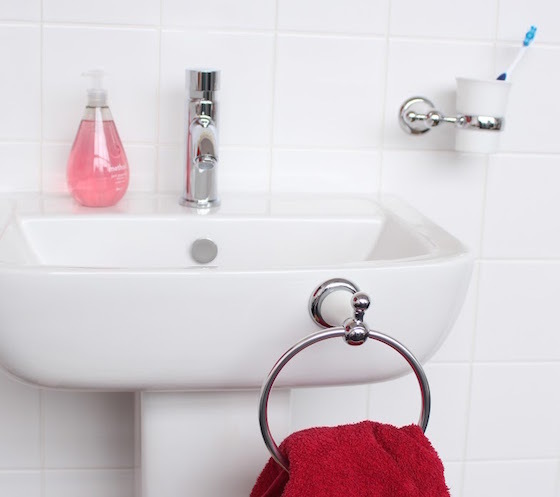 So it&apos;s possible to attach your towel rail to the side of your hand basin, or your toothbrush holder onto the mirror, whatever works for you! With Sugru you can get the satisfaction of attaching things in the places you want them. Clever little improvements like this can be useful all over your home. So why stop at the bathroom? Give it a go, it&apos;s liberating!